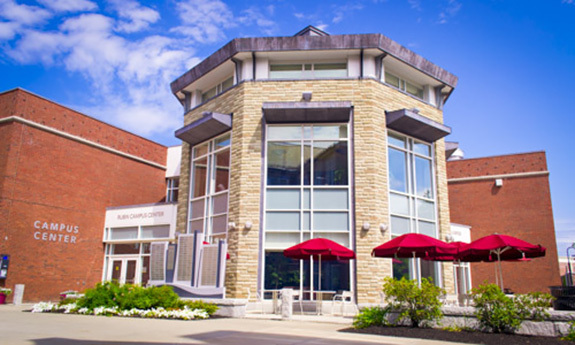 WPI's Rubin Campus Center is part of the educational program of the university, providing opportunities for involvement and student leadership, programs that nurture personal growth and community development, and services that enhance life at WPI. The Rubin Campus Center is at the crossroads of the campus. Whether you want to pick up your mail, grab a cup of coffee, or host a meeting, the Rubin Campus Center fits all these needs. It’s home to our Bookstore and Food Court, the Office of Student Affairs and Campus Life , as well as a comfortable location to study or visit with friends. Enjoy a concert on the patio, meet for lunch, catch a comedy show on the stage in the Food Court, reserve a room for a meeting, grab a coffee at Dunkin' Donuts, or relax in the Class of 1946 Lounge. Monday - Thursday: 7:00 a.m. - 12:00 a.m.
Friday: 7:00 a.m. - 2:00 a.m. Opens at 7:30 a.m. on weekdays and 8:00 a.m. on weekends during the academic year and on term breaks.